Be sure to scroll down this page to see what's going on in this season's issue. This web site is at a screen size of 800 X 600 pixels. If you have to scroll to the right to see it all, you need to change your screen settings to 800 X 600. Stump The Hummer 2000 Pictures are now up! Click here! Click here to follow us on our search for Hell Gate on the Dead Diamond River. Unimog in Guildhall or Lunenberg, Vermont. George Graber in the passenger seat. Sort of reminds you of a Robert Frost Poem about taking the road less traveled by. Paul Doherty, author of "Smoke From A Thousand Campfires" is no longer with us. He passed on to the "happy hunting grounds" a few weeks ago. I greatly admired his writing and will miss him a great deal. He wrote a weekly column in the Beacon I looked forward to on Mondays. I only had the benefit of talking with him on the phone a couple of times and had wanted to meet him. It's too late now. My priorities have now changed to meeting as many of the old fellows from the area I've wanted to meet for a long time before they are gone. I hope you'll bear with me on this. This is kind of a personal thing. I will forever regret not "making the time" to meet Paul.... Enough said. As I get to it you'll find stories on this site about the area and the older folks who know the "real" Great North Woods. 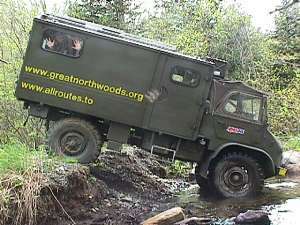 Now that we have our Unimog I can take some of them to places they have known in the past but couldn't get to in years. July 4th 2000 was spent with George Graber, retired pilot and guide. We had a great time in the Unimog roads he hasn't been able to see in over 25 years. These are back "roads" in Guildhall, Vermont that were once busy thoroughfares in a farming community. All that's left are moss covered stone walls and foundations, overgrown apple orchards. The forest has reclaimed it all. About 1/3 of the way along in the parade in Lancaster I spotted George and his wife watching from their truck. I immediately pulled to the side and asked if he's like a ride in the Mog. He hopped in as quickly as his 79 year old legs could do the job. A few minutes later Gomer Powell recognized him from the reviewing stand and boomed over the PA, "There's George Graber!" and went on about the Unimog. (Gomer and I went for a spin in it a couple of weeks before). We had a fun ride the rest of the way down the parade. I discovered a new fun thing with the Mog. If you get on and off the gas quickly a few times you can make it buck like a horse. A real crowd pleaser. I asked George if he could go for a Mog ride that afternoon and he said he'd love to. A couple of weeks before while out for a ride with Chip Greive (A soon to be Mog owner) we had bumped into George in the middle of nowhere. He had remarked he would like to be able to see some of the places he hadn't been able to get to in years due to the roads having fallen into disrepair and being swallowed by the woods. Here we are climbing a skid trail just above a landing in the puckerbrush. Notice the boulder under the Mog. On the way there George noticed a dead tree by the road, and remarked, "Look, a dead dog tree!" I didn't get it, "huh?" He deadpanned, "no bark." We bumped into some of George's friends as they were walking around the mountain to return to their ATVs. They had been out doing a historical survey of some of the old roads. We gave then a ride to a little closer to their destination.They were kind enough to do a little photography for us. Next we proceeded over to the Cantin's. Harland had told me about a large granite monument way out in the woods dedicated to the first church in the area. He and some of his clan were kind enough to guide us to it for some pictures. A few years ago this road was quite passable. The forest chokes out a road in a hurry. A few blowdowns had to be cleared so we could get by. Finally the monument. Surrounding it you can still see the remnants of the old stone foundation of the church. It's amazing what you find out in the woods! Joel White from Dalton aiming for a target. The fellow in black is holding an electronic scoring device that "hears" stots and hits on the steel targets. The "clang" of bullets against the targets is interesting to hear. Joel came in his Jeep 4X4 (below). The Dalton Gang's events are held in an old gravel pit which makes an excellent spot to try out a Unimog too! A word to the wise! If you do something stupid like hiking unprepared off into the boonies and require a rescue, you will now be BILLED for the cost of removing your hide from the woods or mountains! Click here to check out our "new" Unimog. Cruise Night in Lancaster... Check the calendar section for the next one. Spiked Boots is in print again! 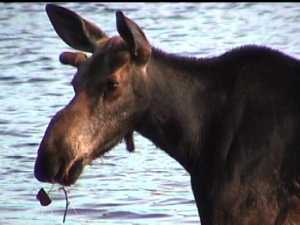 This is a great tale of the river drives and other interesting stories in the Great North Woods of Northern New Hampshire! Click here to read some excerpts and see a picture from Spiked Boots to whet your appetite. usually end up plowing for those who didn't." Articles, pictures and links to articles will be added here as the month goes on. This is becoming sort of a monthly magazine format that evolves as events happen. Click on the Summer 1999 section to see the beginning of the New Hampshire primary in the Great North Woods Region. You'll also find an interesting camp, an iron horse and a couple of houses moving among other interesting things. Scroll below to see new stories and links as I add them. Want to join the Spirit of New England Webring? This Great Outdoors Ring site is owned by Great North Woods. Have you tried The The Outdoor World Companion? owned by Great North Woods.